...we made it even though we had our backs up against the wall..."
Anywayz... when I saw this picture, I couldn't help but laugh out loud! I wondered why 2011 looked so sad that it was all over. It shouldn't be really... because in 2011, a lot of us moved just that little bit forward in our lives, either in the form of a job, a promotion, a spouse, a child... But while there were upsides, there were also some downsides. BUT you know what?! One thing I have learnt is to always be grateful! We all lived to see the end of 2011...and we all have another chance to write better chapters in our lives. So for all y'all who postponed a lot till "next year", guess what?! 2012 is just over an hour away...well on this side of the world anyway. What plans have you made for next year... which is really just tomorrow. What goals have you set for yourself in 2012?! What have you decided to do differently in your lives and businesses? What steps have you taken to turn your lives around?! I don't mean to give a lecture or anything but really...have you thought about it?! I know I used to be one of the first people to tune off when people mentioned stuff like goal setting, planning for the future, mission, vision statements, etc but now I know better. Now the statement "failing to plan is planning to fail" makes so much sense now. So as we are about to hit 2012, I implore you to take yourselves seriously and make a plan for yourself. Reasonable plans. It's not about writing resolutions we all know deep down are not sustainable. Want to know what my New Year's resolution is? What it has always been for the past few years. "To be a better person!" That way, I never fall victim to breaking that resolution. My brother taught me that! As 2011 draws to a close, here's my prayer for anyone reading this. May you achieve all and a lot more that you have ever hoped for. May God's guidance and blessings be with you now and always AND may His goodness and mercy follow us and be with us all each day, from now...till 31 December 2012... and for many more "December 31sts" to come. Amen. Here's to us all. 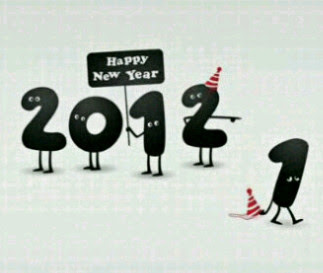 Here's to 2012! Happy New Year in advance everyone! Enjoy the last hour or so of 2011 and see you all on the other side of midnight!